The Drowned Captain (Dux submersus "drowned leader") is a boss-monster. As is common knowledge, captains are expected to and often do go down with their ships. The Drowned Captain was no exception and as his beloved vessel began to take on water he stood fast on the bow and waited to die. He thought that would be the end of him but just as he was slipping away into the eternal darkness a voice called out to him. It said, "The Gods have a job for you in the afterlife, awaken and do Our bidding." Well it wasn't as if he had any choice in the matter and so he rose from his watery grave in order to confront heroes who have embarked upon this mini-quest. 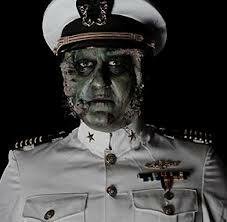 Defeating this dismal sea captain may get you Davy Jones’ locker, among other things. Opening it requires 50% godpower and may effect your hero(ine) in a good or bad way. 03:56 The Drowned Captain doesn't want me to wake someone who sleeps with the fishes! Quick healing and - to arms! 05:24 Suddenly felt like I had to make use of the Davy Jones’ Locker. Shook it as hard as I could and out came a new, shiny golden brick! This page was last edited on 18 February 2019, at 15:10.